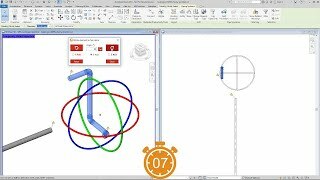 Connect elements, Connect & rotate elements, Connect & copy elements, Rotate elements around another element, Rotate elements in free space, Reconnect elements, Attach hangers to routing systems and Attach & extend hanger rods to construction elements. Simply select the element you want to connect and the element you want to connect into. No need to align and drag the element to the position where it should be connected. Or connect and rotate in one run with just 3 clicks. No need to go through all the steps imposed by the native Autodesk® Revit® functionalities anymore to connect, copy, and rotate elements or entire systems; with just a few clicks you can now perform these actions in any view, including 3D views, without having to create separate section views. 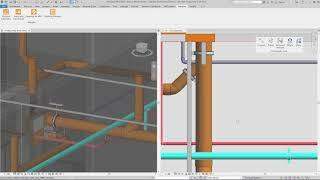 No unwanted elements are created when using the three connectivity tools; the selected element(s) will be moved and then directly connected to the reference element; no additional pipes, ducts or fittings added between them. 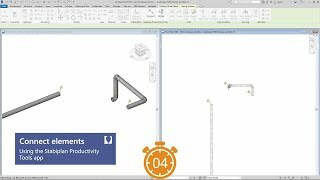 With Connect & copy elements you can improve your productivity by making multiple copies of an element (like equipment or specific fittings) and, contrary to Revit, by connecting it immediately to other elements (like pipes or ducts). 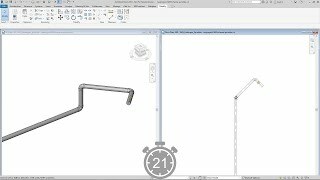 Rotate single or multiple elements (like pipes, ducts, and fittings) connected to a system by specifying the desired direction and angle; opposed to Revit, the connectivity won’t be lost. 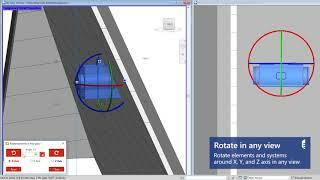 Rotate single Revit families, multiple elements connected to each other, assemblies or groups around X, Y, and Z axis in any view, including 3D views by using the intuitive rotation helper provided by the Rotate elements in free space tool. Reconnect elements makes it easy to reconnect multiple disconnected system elements in one click, instead of element by element. Attach hangers (like brackets, support profiles and support consoles) to pipes, ducts and cable trays in routing systems with just two clicks. The hangers adjust automatically according to the size of the element to be attached to. Attach and extend hanger rods to architectural and structural elements (like rails, support profiles, walls or ceilings) in one go. The threaded rods are automatically extended and can be attached also to sloped elements from your current project or a linked model. Depending on the selected elements, the relevant tools will be shown to you in the context-sensitive ribbon, saving you clicks.